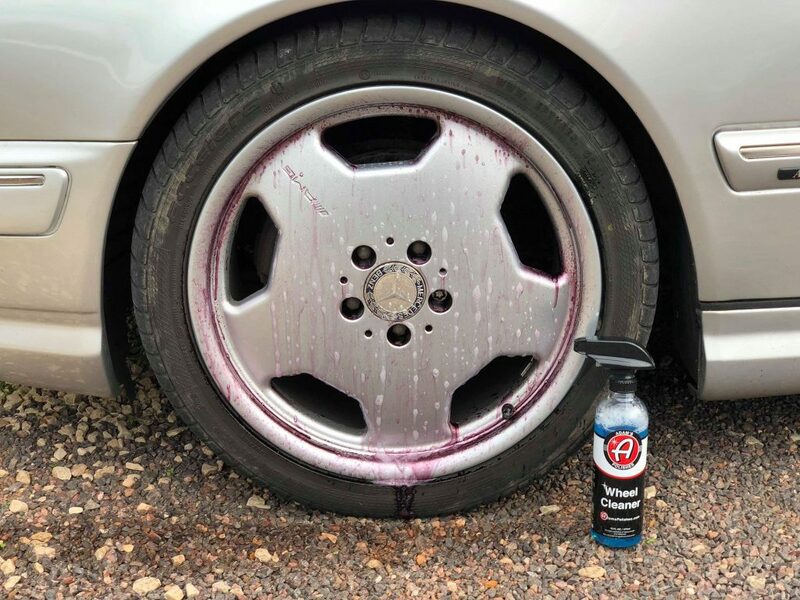 For those that have invested thousands into fancy wheels for their car, its worthwhile using a powerful yet safe wheel cleaner to keep them clean. Brake dust buildup can become fairly tough to remove but not with the correct product. 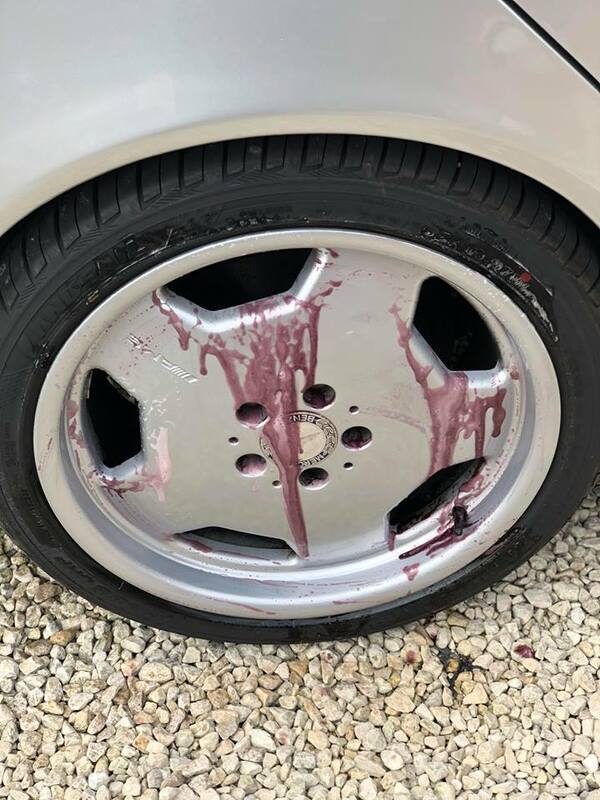 The best wheel cleaner is the Adam’s Polishes Deep Clean, which eliminates all dirt and brake dust with an acid free and pH neutral formula that turns purple when used. Even if you are using the best car wash soap possible, you may find yourself struggling to remove built up brake dust. The unique formula of most wheel cleaners simply break the dust down to the point that it can be wiped clear with ease. The simplicity and ease of use when using a wheel cleaner make its a much loved detailing product. 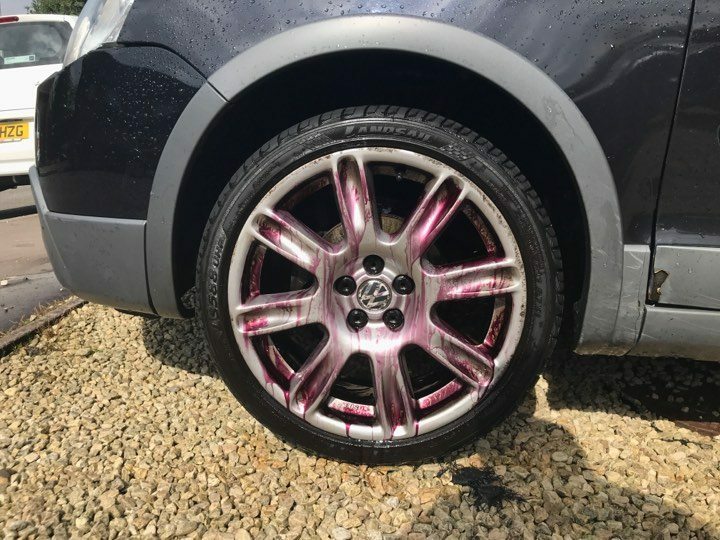 Blasting the wheels with a powerful car pressure washer and then spraying the formula onto the wheels will see virtually all the tough dirt removed. Before purchasing any wheel cleaner, you should be very cautious as some may be too strong for your wheels. If you have uncoated aluminum wheels, you will need to use a gentle wheel cleaner otherwise it could cause damage to the wheel. Dirty wheels can be a real pain and particular difficult to remove if the dirt has been sitting on the wheel for many months. Below is a list of the best wheel cleaners that are safe to use and will removed all tough dirt and brake dust. The popular Adam’s Deep Wheel Cleaner is an efficient and effective solution for getting your wheels squeaky clean, even when you’ve been driving around in the dirt and grime. It is formulated to remove thick layers of brake dust quickly, without the tedious scrubbing of the wheels. Adams Deep Wheel Cleaner is one of the easiest ways to get grime off of your wheels. The powerful spray formula is quick to use and removes brake dust without damaging your car. Overall, it is the best wheel cleaner and you have the option to bulk buy, which is great for those that want better value for money. The CarGuys Premium Wheel Cleaner is designed to safely clean both your wheel and tires of everything that they encounter on the road. It is truly a premium product that you can use on all vehicles and motorcycles wheels. The CarGuys Premium Wheel Cleaner is one of the most effective options for removing strong brake dust buildup. It is completely safe to use and very environmentally friendly. This product is a good option to keep in your garage for car touch-ups and the most popular wheel cleaner on the market. Meguiar’s Ultimate All Wheel Cleaner is another powerful wheel cleaner that works quickly to remove all debris, grime, and brake dust left on your wheels. It is safe to use and comes in large bottle sizes, but is still very affordable. The Meguiars Ultimate All Wheel cleaner is an affordable yet effective option for keeping your wheels shiny and clean. It’s safe and efficient, so it is simple to add into your car washing routine. Interestingly, its not as popular as the other Meguiar’s products but nevertheless, it will certainly perform as expected. The Chemical Guys Wheel & Rim Cleaner is a professional level wheel cleaner that has a deep blue color and strong formula. It is very powerful, so you should always dilute it in water, using a 1 to 7 ratio of cleaner to water. The Chemical Guys Wheel & Rim Cleaner is one of the best options for removing very large deposits of grease, dirt, and brake dust. The formula is very powerful, so everything comes off in one use, instead of having to scrub or rinse multiple times to break up all the dirt. If you are looking for bang for your buck, the 1 gallon option provide a huge 128 ounces at a cheap price. Therefore, if you purchase a few spray bottles, this can last a long time and make it the best wheel cleaner for the money. The Meguiars Hot Rims is the best aluminum wheel cleaner due to its gentle formula that is safe for bare aluminum wheels. Meguiars is one of the best brands of car detailing products, and this product lives up to the brand’s reputation as well. Here are the notable features of the Meguiars Hot Rims Aluminium Wheel Cleaner. The Meguiars Hot Rims Aluminium Cleaner is a good option if you’ve tried other cleaners and found them to be too strong or damaging for your rims. It is affordable and a great way to spot clean your wheels without any harsh chemicals. If you’ve invested in high quality wheels for your car, it’s important to have a good wheel cleaner on hand to keep them in good condition. When shopping for a wheel cleaner, there are a few things to look for to make sure you’re getting the best quality formula. The more effective your formula is, the easier and less frustrating your cleaning process will be. You will also get more bang for your buck. Here’s what you should look for in a wheel cleaning buying guide. Of course, the first and most important thing to look for when choosing a wheel cleaner is how effective it is at removing dirt and grime from your wheels. Ideally, the cleaner should wipe away everything in one use, without extra scrubbing or multiple layers. It should also cut through the range of things that can dirty up your rims, ranging from brake dust to oil and grease to salt and snow. The stronger the cleaner, the more effective it will be at getting rid of all of these problematic substances. Ideally, the formula should separate the grime from the surface of the wheel, making it easy to rinse off with a hose. The size of the bottle is something else to consider when shopping for a wheel cleaner. The more cleaner you have, the more washes you will be able to get out of it. Large bottles can last you for months or years, depending on how often you clean your car. You should also look at the price per ounce or gallon of the cleaner. This will determine whether or not the bottle is a good deal. Finally, you should consider how much of the cleaner you will need for a wash. If the cleaner is very concentrated and you need just a small amount, you can get many more uses out of the bottle than you would with a cleaner that is more diluted. The cleaners you use on your wheels should always be pH neutral to prevent damage to your car. pH neutral formulas are not going to damage your paint job or have any other detrimental effects on your car. They also won’t damage your tires or brakes. Cleaners that aren’t pH neutral often contain acid, which is very dangerous for cars, particularly those made from sensitive materials. Acid can erode the metals and paint on your car and be very detrimental. For example, center caps are often made from weak materials but more worryingly is people using strong wheel cleaners for uncoated aluminum wheels. This can destroy the wheels and you should use a dedicated aluminum wheel cleaner to safely clean them. Acidic formulas also can be dangerous to the people using them, so you would need to be much more careful about the application method and where you washed your tires. When purchasing a cleaner, you should also always double check what types of surfaces it is intended for and cross-check it with the materials your car is made from. While most pH neutral cleaners are safe for all surfaces, some are not. Some cleaners are also designed for more sensitive surfaces, so they might not be as effective for extreme dirt and grime. Another thing to look at when choosing a cleaner for your wheels is the method of cleaning that the manufacturer recommends. Most cleaners will have detailed instructions for how to clean your wheels using their specific cleaner listed on the back of the bottle. Before making your purchase, make sure you understand how to clean your wheels and that you have all the materials needed to clean them appropriately. You should also ensure that you have an appropriate space in which to clean your wheels. Many wheel cleaners are colored, and this isn’t just to make them look pretty. This is actually to help you identify where you have sprayed the product so you can get a completely comprehensive wash. Many cleaners will also cling to the debris and turn it a bright color, so that you know exactly where to rinse off. Although it isn’t essential, a colored formula can make the process of washing your wheels much easier. The odor of the wheel cleaner is another factor to consider when making your purchase. If you are sensitive to chemical smells, then a cleaner with an odor may end up giving you a headache, making the washing process very unpleasant. Ideally, your wheel cleaner should not have a smell at all, or it should have a very light, pleasant smell. Cleaners that have very harsh, chemical smells are often dangerous for sensitive car materials, so this is something else to keep in mind. Some cleaners have a foaming consistency, so they turn from liquid to foam after they’ve been sprayed onto your wheel. Other cleaners stay liquid the entire time. Many people find foaming cleaners to be easier to use and that they wipe away dirt more effectively. There are many foaming cleaner options, so it’s helpful to look at this feature when purchasing the product. Since you will likely be washing your car outside, it’s important to make sure that the formula you choose doesn’t have any harmful chemicals that could damage your surrounding area. Look at the long ingredients list on the back of the bottle or the product listing to get a better idea of what the formula actually contains. To keep your wheels in the best possible condition, you should clean them regularly to remove dirt and other debris. Using a high quality cleaner will make the process of cleaning your wheels much easier and more pleasant. Once clean, we highly recommend using a wheel sealant that protects and reduces dirt and brake dust build up to finish things off. You should look for a cleaner that combines strength with safe ingredients that won’t damage your car. The options presented in this guide are some of the best for effective wheel cleaning. Some car brake pads will produce more dust than others and if you cover thousands of miles, it will cause a large build up of dust on your wheels. If this is the case, investing into a wheel cleaner for brake dust is highly recommended to make the detailing process less time consuming.